I am trying to get organized before my trip to Vermont next weekend! I am so excited at the prospect of spending over a week with my son and his family. My grand daughter’s daycare provider is on vacation for the week leading up to Labor Day. This is my lucky break!!! She and I will get to spend a whole week together. Her parents are even going to take a quick mini vacation while I am there. This will be the first time they have been away over night without their girl. I am sure they will have a great time as will she and I! 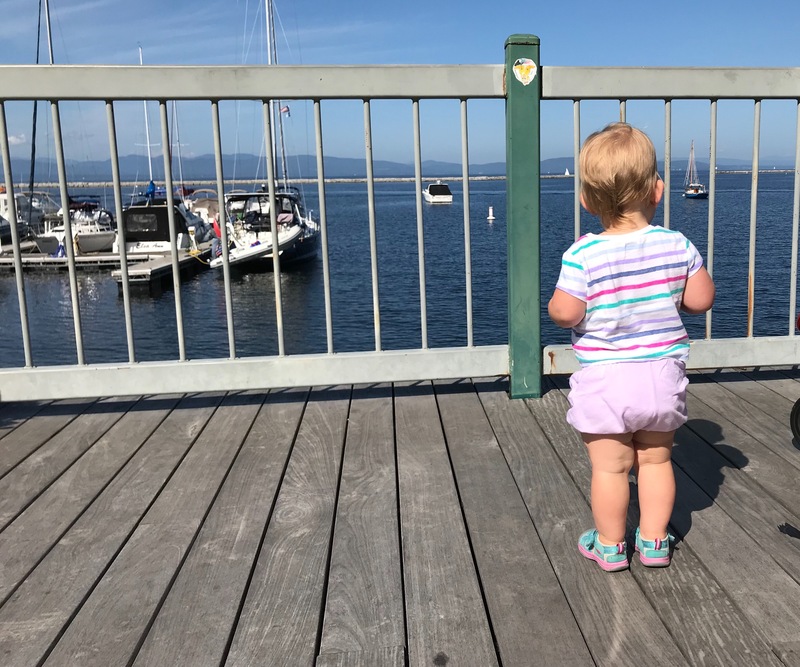 Grammy’s girl – watching the sail boats. The decision I am faced with is which projects to bring to work on while in Vermont. My daughter in law has a sewing machine and I plan to set it up for the week. My grand daughter is (fortunately) a very good sleeper with usually a 2 hour nap in the afternoon and an early bedtime at 7pm or so. This will leave some sewing time for Grammy. So far I have some fabrics cut to make a few new pillow cases for my grand daughter. I made two for her at the beginning of summer and I thought she would like another one or two. Also, I cut out this simple shirt. I prefer View B which has only the front and back pieces so it will be a fun, quick project. I will finish the neck line and armholes with bias tape in a contrasting color (which reminds me – I still need to get the bias tape!) I chose this voile by Katarina Roccella (which is listed in the shop) – I love the dark gray background with colorful little flowers. There will be plenty of time to wear this as our weather doesn’t usually cool down very much until October or so. 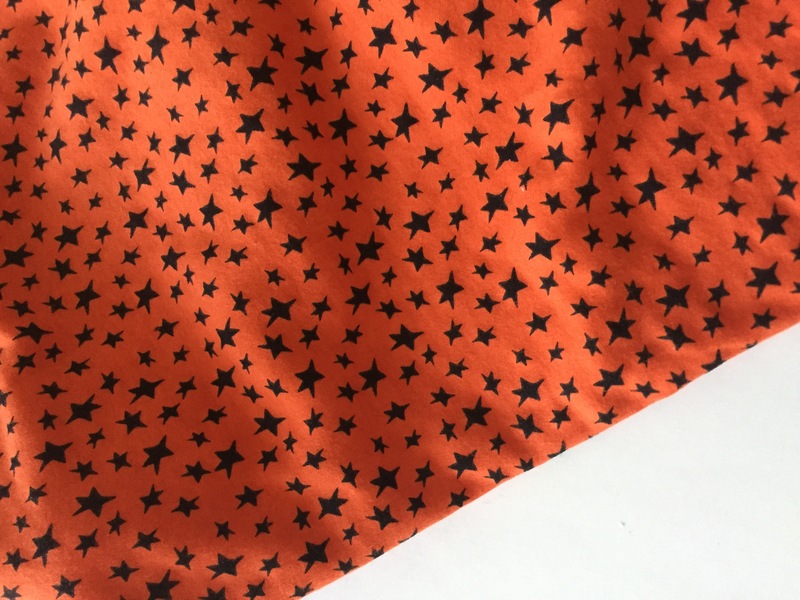 Julia and I were in Jo-Ann Fabrics last week and we saw this Halloween knit fabric. Doesn’t it look perfect for leggings for a toddler with the chubbiest thighs ever? I totally agree! So, that is project number three. I just need to collect the thread and notions I want to bring and put it all together. I think this should keep me busy during nap times. But just in case I need more, I am going to take a big stack of charm squares. Those are easy to pack and I can always just do a patchwork quilt. It is good to have choices! Hopefully I will have a good bit of sewing time, but who knows? Life with this toddler could be totally different when she figures out her parents are away. Alison Glass Prints from Handcrafted and 76 – on sale this week!! One more thing before I close the post. If you are an Alison Glass fan, you are in luck. 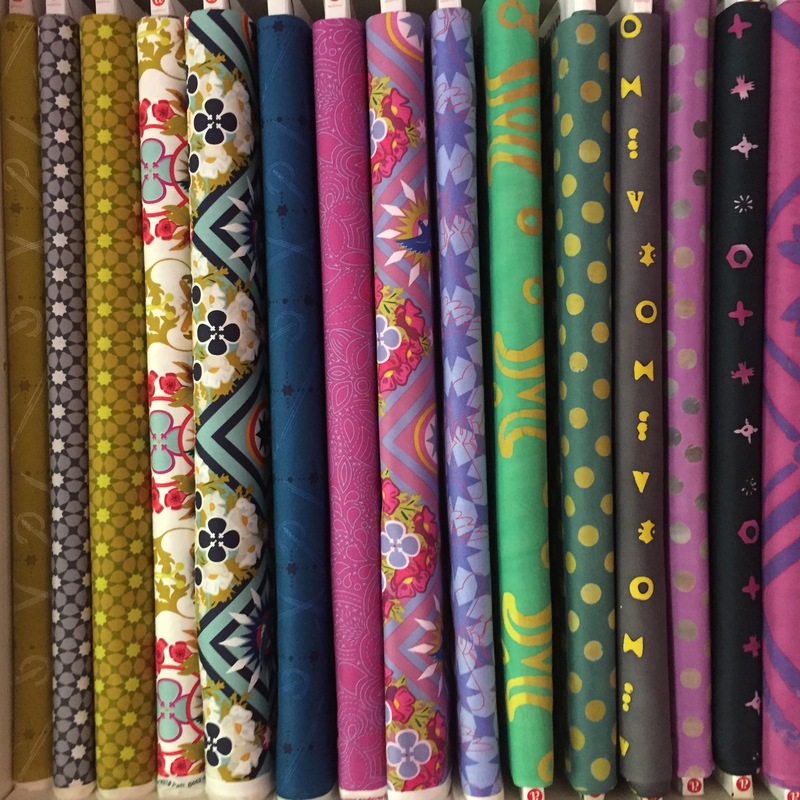 All of the Alison Glass fabrics are on sale this week for 25% off! Sale begins today and runs through the end of the day on Thursday, August 23rd. Take advantage!! 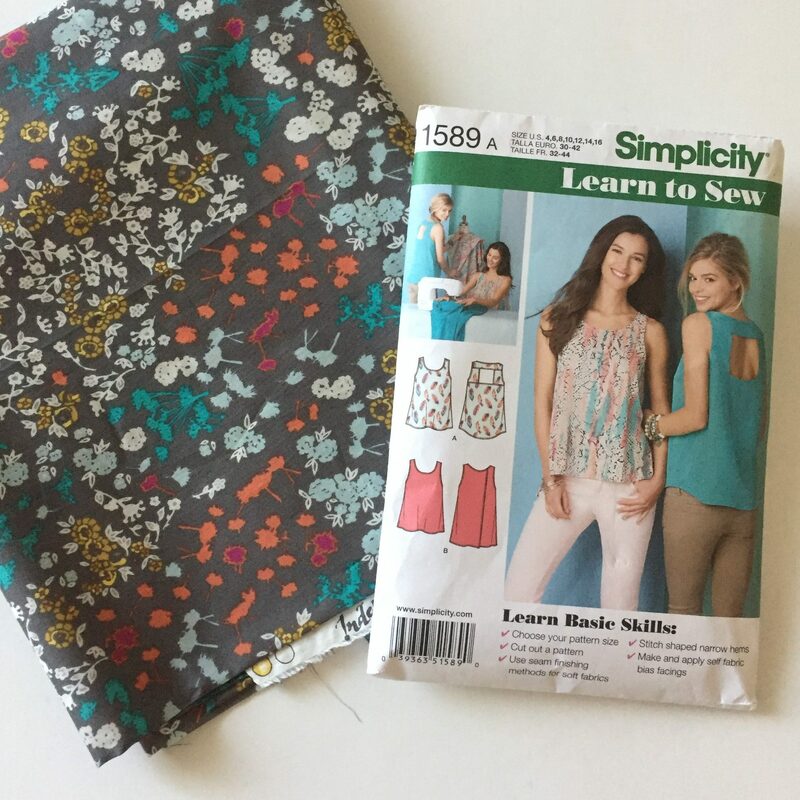 This entry was posted in Quilting Skills and tagged Art Gallery Fabrics Voiles, fabric sale, simplicity 1589 on August 20, 2018 by Bernie. I’m excited for your trip, Bernie! Enjoy every minute with that little cutie! I think you have some great projects lined up to work on. Love that Halloween knit. That knit is going to be super cute. I just prewashed the fabric so I am good to go. It will be easier to make them with her there to measure that belly for the elastic. So fun!! Those sound like great projects to take with you. I hope you have a fantastic week with your granddaughter! I plan to Louise! She loves to play out in the yard and also to be read to – both of which will be so much fun. Can’t wait!! You will have a wonderful time and I bet you will get some sewing done. Sounds like the most satisfying thing will be having it pre-prepped – like for a retreat so you can zoom along! Exactly!! I figured if I got things cut and prepped, I should be able to make them in the evening when she goes to bed. That is the plan anyway…. We will see! I cracked up when you said “chubbiest thighs ever” because when I saw the picture of her watching the sailboats my thought was exactly that – Oh those chubby double knees! those thighs!! Funny how it is admired in toddlers but not so much in adults… Have a wonderful time, spoil her rotten, and keep us updated with photos! Haha – Yes, I rarely look at my legs and say – oh how cute those chubby thighs are. But on her it is adorable! We will have a blast and yes, I get to spoil her all week long! Thank you Roseanne. I am getting so excited!! I will share a few pictures during the trip – I am sure. Have a great week. I am so excited for you to spend time with your family and granddaughter. Look forward to sweet pictures – what a fun age she is! Your going to have so much fun in Vermont!! And if you can top it off with a little sewing, all the better! I love that top pattern! I swore this was the year I would try making clothing, but alas…I’m all talk and no action! No action?????? I don’t think so Jayne. You have made so many amazing projects this year. Modern quilting is your thing and you excel at it. All talk and so much action!! I hope you get everything done before you leave, Bernie! Have a lovely, lovely time. Be sure to show us your sewing results!